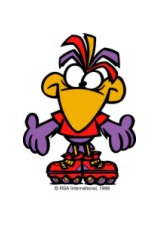 The Roller Skating Association International (RSA) has licensing opportunities available for our mascot characters, Roooofus the Roller Roo® and Kooky A. Bird®, as well as our roller skating clip art. Our goal is to provide members with a well rounded and varied selection of Roo and Kooky products that can support the character program. The RSA offers an extensive product line that includes Roo and Kooky clip art, name badges, posters, cups, temporary tattoos, tokens, redemption tickets, trading cards, coloring books, storyboards and brochures. We currently have licensees that offer Roo and Kooky t-shirts and apparel, birthday party supplies, youth inline skates, costumes and mascots, skating center signs, and flags and banners. Inclusion in a special licensee section of our annual membership directory that is sent to all members. The use of our Roo and Kooky characters requires a licensing agreement with an 8% royalty fee. Upon completion of an agreement, the RSA will provide CDs containing all our images of Roo and Kooky. A clip art licensing agreement with the RSA gives you the right to use all RSA-produced clip art images, except those containing Roo and Kooky. The RSA produces approximately 150 new roller skating images each year. All of these images, past and present, would be available for the length of the licensing agreement. 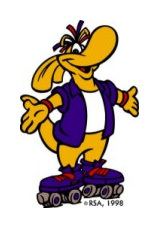 The licensing fee for the use of our roller skating clip art is 6% with a corresponding sales report, which must be made to the RSA on a quarterly basis. An affiliate membership with the RSA is required prior to granting any licensing agreement to a business. For more information about becoming a member of the Roller Skating Suppliers and Manufacturers (RSM), click here. Click here for a list of current RSA licensees. If you would like further information about RSA licensing opportunities, please contact our marketing department at marketing@rollerskating.com or call the national office at 317-347-2626.